* Use to fill horizontal, vertical, and overhead non-moving saw-cut, construction, control joints, and cracks. * Use also as a flexible adhesive. * Two consistencies to fit project requirements. * 2 to 1 ratio ensures easy mixing, easy handling. * Shock-absorbent ... resists wheels and heavy loads. * Use as a security sealant. 3-gal. units; 12-fl. oz. units, 12 per case. Sikaflex-1CSL is a single component, self-leveling, premium-grade polyurethane sealant with a accelerated curing capacity. Meets Federal Specification TT-S-00230C, Type 1, Class A. Meets ASTM C-920, Type S, Grade P, Class 25. 20 fl. oz. uni-pac sausage seals 24 lineal ft. of 1/2 X 1/4 in. joint. 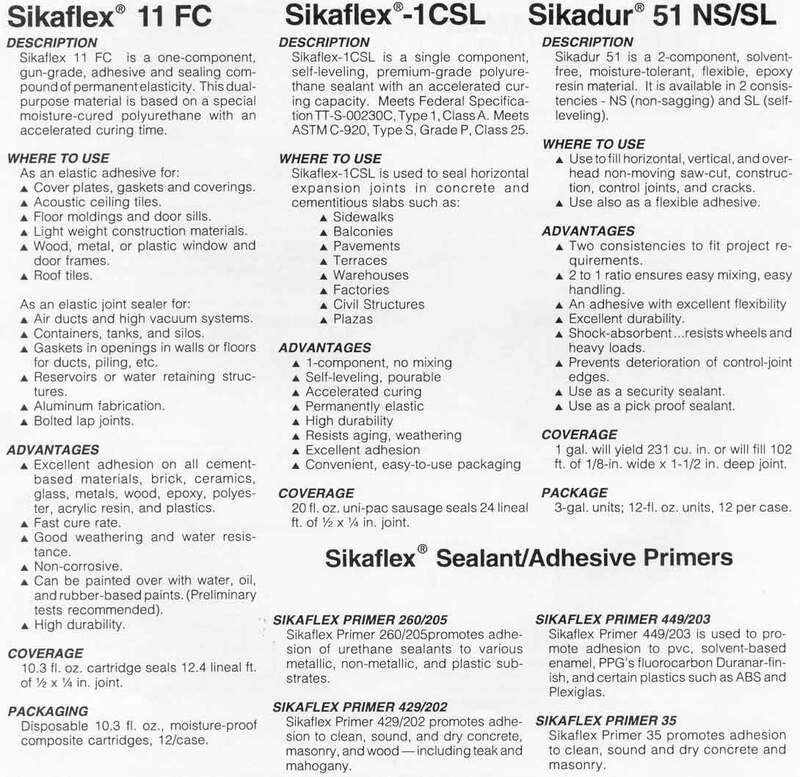 Sikaflex 11 FC is a one-component, gun-grade, adhesive and sealing compound of permanent elasticity. This dual purpose material is based on a special moisture-cured polyurethane with an accelerated curing time. * Cover plates, gaskets and coverings. * Wood, metal, or plastic window and door frames. * Air ducts and high vacuum systems. * Containers, tanks, and silos. * Gaskets in openings in walls or floors for ducts, piling, etc. Sikaflex Primer 260/205 promotes adhesion of urethane sealants to various metallic, non-metallic, and plastic substrates. Sikaflex Primer 429/202 promotes adhesion to clean, sound, and dry concrete, masonry, and wood -- including teak and mahogany. Sikaflex Primer 449/203 is used to promote adhesion to pvc, solvent-based enamel, PPG's flouocarbon Duranar-finish, and certain plastics such as ABS and Plexiglas. Sikaflex Primer 35 promotes adhesion to clean, sound and dry concrete and masonry. Sikaflex -1a is a premium-grade, high-performance, moisture-cured, 1-component, polyurethane-based, non-saf elastomeric sealant. Meets Federal specification TT-S-00230C. Type II, Class A. Meets ASTM C-920, Type S, Grade NS, Class 25; Canadian Standard 19 GP-16A, Type II. * Designed for all types of joints where maximum depth of sealant will not exceed 1/2 in. * Excellent for small joints and fillets ... windows, door frames, reglets, flashing and many construction and adhesive applications. * Suitable for vertical and horizontal joints; readily placeable at 40F. * Has many applications as an elastic adhesive between materials with dissimilar coefficients of expansion. * Eliminates time, effort and equipment for mixing, filling cartridges, pre-heating or thawing, and cleaning of equipment. * High elasticity - cures to a tough, durable, flexible consistency with exceptional cut and tear-resistance. * Excellent adhesion - bonds to most construction materials without a primer. * NSF and EPA approved for potalbe water contact. Compatibility tests are recommended. * Urethane-based; suggested by EPA for radon reduction. * Capable of +-25% joint movement. 10.3 fl. oz. cartridge seals 12.4 lineal ft. of 1/2 X 1/4 in joint. Sikaflex-2c, NS/SL is component, premium-grade, polyurethane-based, elastomeric sealant. It is principally a chemical cure in a non-sag and self-leveling consistency. Available in 40 colors with convenient Color-pak. Also available as a pre-pigmented product in both grades in Limestone Gray. Both grades meet ASTM C-920 and Federal Specification TT-S-00227E. * Intended for use in all properly designed working joingts with a minimum depth on 1/4 in. * Ideal for vertical and horizontal applications. * Placeable at temperatures as low as 40F. * Adheres to most substrates commonly found in construction. * Capable of +-50% joint movement. * Chemicla cure allows the sealant to be placed in joints exceeding 1/2 in. in depth. * High elasticity with a tough, durable, flexible consistency. * Exceptional adhesion to most substrates without priming. * Available in 40 architectural colors. * Color uniformly assured via Color-Pak system or pre-pigmented Limestone Gray. * Self-leveling consistency is easy to apply into horizontal joints. * Paintable with water, oil, and rubberbase paints. * Non-sag is NSF approved for potable water paints. * No Color-pak needed in pre-pigmented Limestone. 1 gal. yields 231 cu. in. or 154 lin. ft. of a 1/2 in. X 1/4 in. joint.